Quercetin occurs naturally in a variety of brightly colored plant-based foods. This flavonoid compound has antioxidant and anti-inflammatory properties and may help lower the risk of cancer and heart disease while decreasing blood pressure. A diet that includes plenty of foods with a high content of quercetin will also be rich in dietary fiber, vitamins, minerals and other antioxidant compounds. According to the U.S. Department of Agriculture, capers contain one of the highest natural concentrations of quercetin. Canned capers, which are the salt-brined flower buds of the Capparis spinosa plant, contain 173 milligrams of quercetin in every 3.5 ounces, or 14.8 milligrams in a typical 1-tablespoon serving. Use capers in salads, dips, pasta dishes and as a flavor-enhancing addition to sauces for seafood or poultry. Capers are high in sodium. To decrease their sodium content and control the saltiness they add to foods, rinse them thoroughly before using. All types of onions are high in quercetin. Raw red onions contain 33.4 milligrams of the compound in every 3.5 ounces, while raw white onions supply 21.4 milligrams, scallions have 18.3 milligrams and fresh sweet onions contain 14.8 milligrams. Cooked onions have 24.4 milligrams of the compound in each 3.5-ounce serving. To get the most quercetin out of your onions, use them promptly after purchase. Onions can lose more than 25 percent of their quercetin content if they're stored over a week. Fruits with a dark red or blue hue have the highest quercetin content. These include cranberries, which contain 15 milligrams in every 3.5 ounces; raw black plums, with 12.5 milligrams per serving; and blueberries, which have 5 milligrams. Chokeberries, black currants, apples and cherries are also good sources of quercetin. A 2002 article published in "Nutrition" reported that foods prepared by boiling lost a significant amount of quercetin due to contact with heat and water. Whenever possible, eat quercetin-rich fruits raw or only lightly cooked. Raw hot green chile peppers have nearly 15 milligrams of quercetin in every 3.5 ounces. Red leaf lettuce contains 12 milligrams per serving, while raw kale has 7.7 milligrams and cooked asparagus 7.6 milligrams in a 3.5-ounce serving. Romaine lettuce, chicory greens, raw spinach, sweet peppers, snap beans and raw broccoli range in quercetin content from 2.4 to 5 milligrams contained in 3.5 ounces of the food. 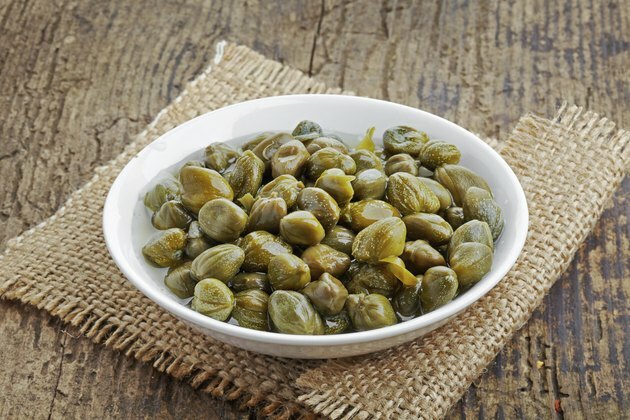 HuffPost Taste: So What the Hell Are Capers, Anyway?